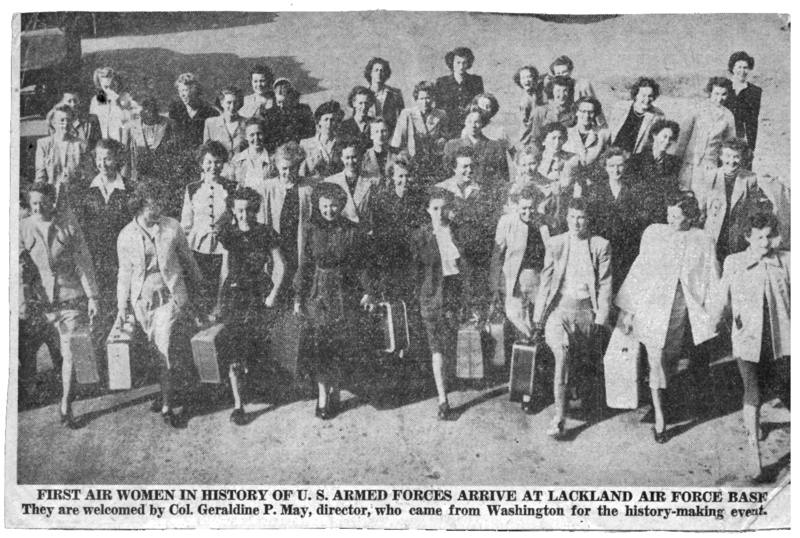 This newspaper clipping shows the first women arriving at Lackland Air Force Base, Texas (courtesy photo provided to the U.S. Air Force). On July 8, 1948, the Air Force accepted the first woman into its ranks. Staff Sgt. Ester McGowin Blake enlisted on the first day women were permitted to join the service — 65 years ago today, Smithsonian Magazine writes. In March 1944, Blake enlisted in the Army Air Forces, where she served one year. A widow with two sons fighting in World War II, Blake joined after her eldest, a B-17 pilot, was shot down over Belgium and reported missing. She reportedly wanted to free up a soldier from desk duty so that he might join the fight and win the war faster, according to an Air Force news release. Both sons survived the war. When the Air Force became a separate branch and opened the doors to women in 1948, Blake, already in her late 40s, was its first female recruit. She served until 1954. Blake died in 1979, but her legacy lives on: A student dormitory at the Air Force Senior NCO Academy at Maxwell Air Force Base, Ala., was named for her in 1987.